Call BOB now at 1-800-245-0708 to order this machine! USED ATLANTA ATTACHMENT AP264DY36. Auto sleeve joining machine. ON Sale for only $3,500.00! NEW BROTHER BAS 300G-01A DEMO ! Programmable pattern sewer 100mm x 60mm. NEW BROTHER BKE 434C NEW!Programmable pattern sewer 100mm x 60mm. 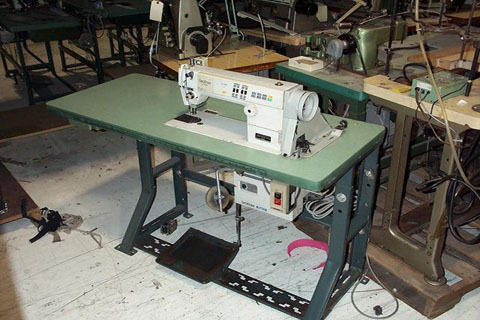 USED BROTHER B272-011-8 Coverstitch machines complete with table stand and motor. 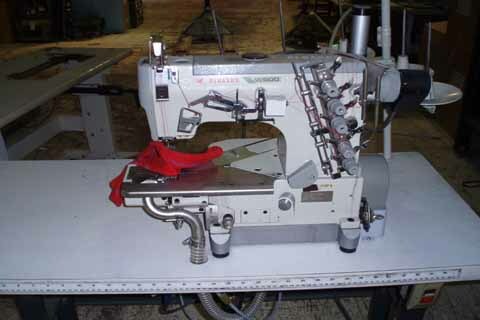 USED BROTHER 737-413 Single needle lockstitch with auto thread and foot lift and servo motor. 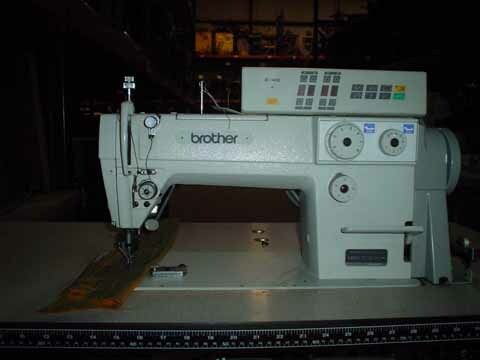 USED BROTHER B772A-903 Single needle lockstitch with edge cutter and undertrimmer. 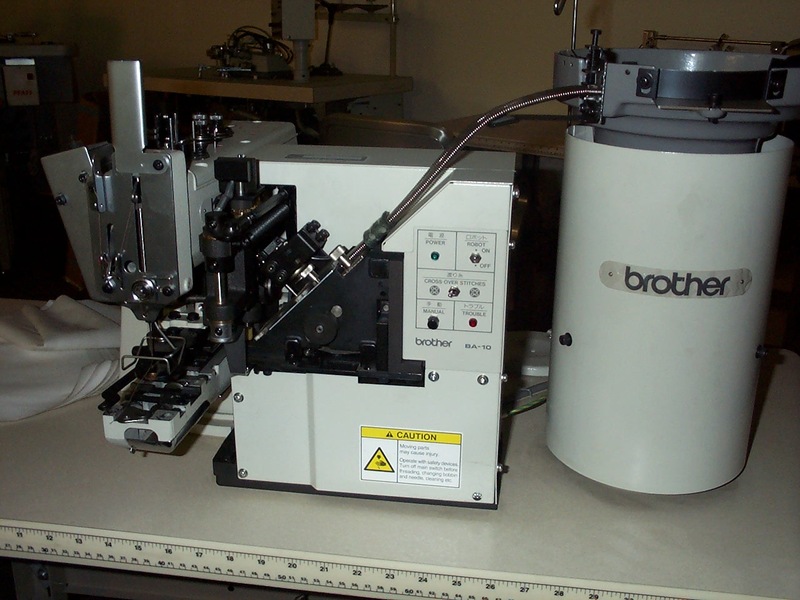 USED BROTHER B774-915- Single needle top and bottom feed lockstitch with undertrimmer. 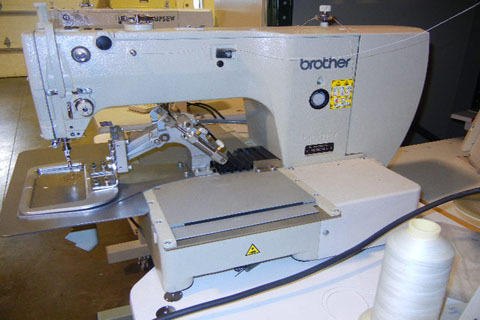 USED BROTHER B791-413 Single needle ,needle feed lockstitch with auto thread trimmer and auto foot lift and servo motor. 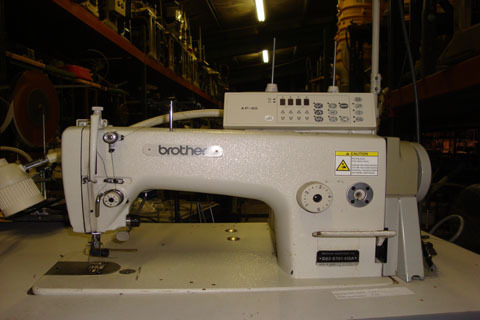 USED BROTHER B917/BA 10 - White button sew with feeder complete with table and motor. 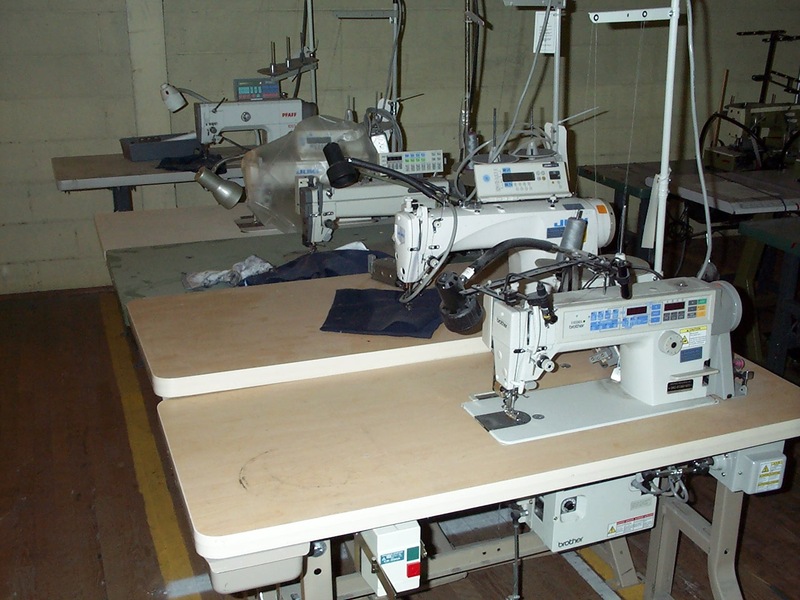 USED BROTHER B7380 -923 Single needle lockstitch with autp ply sensor and auto thread trimmer and aut foot lift and servo stand. 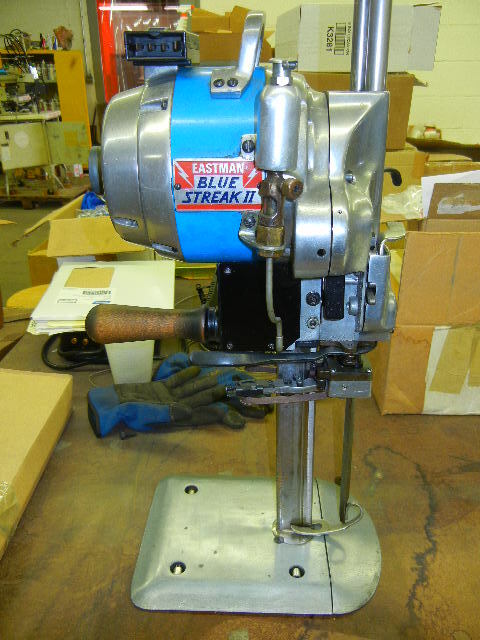 USED BROTHER FD3- B257-011/UT 34 Cylinder arm coverstitch with undertrimmer complete with table stand and motor. 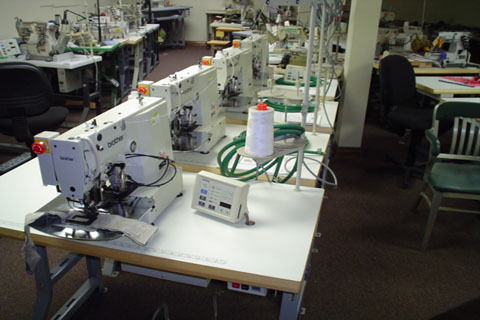 USED BROTHER MA4-B694-092-6 Heavy duty top feed heavy duty safety stitch machines complete. NEW HIGHLEAD GC 20638-D Double needle compound feed split bar walking foot machines with auto thread trimmer and auto foot lift and complete servo motor stand and new light. 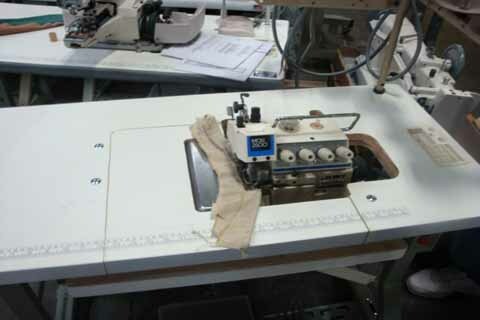 LIKE NEW JUKI AMS 221E-HN2516 Direct drive computer controlled pattern sewer with 250mm x 160mm sew field. NEW JUKI DDL 8700BS-7-WBK Direct drive single needle lockstitch with auto thread trimmer and auto foot lift and complete stand and LED light. 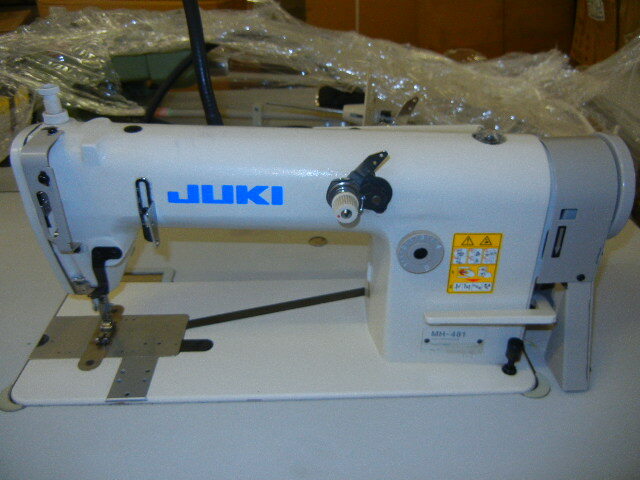 LIKE NEW JUKI 3600L-20 Direct drive single needle Flatseam machines. 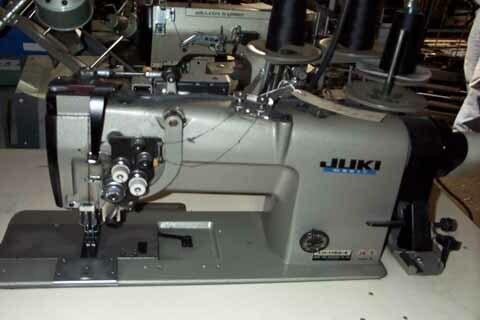 JUKI DLU 490-4-3B Top and bottom feed single needle lockstitch with auto thread trimmer and servo stand. ON Sale for only $950.00! 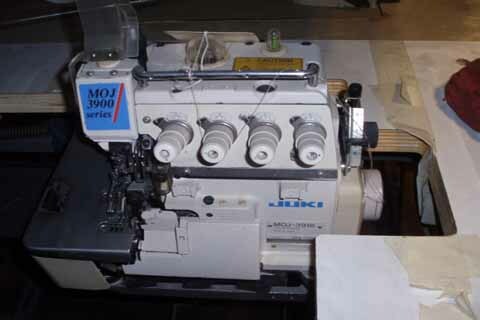 USED JUKI DLU 5490N-7-WB Top and bottom feed Top and bottom single needle lockstitch with auto thread trimmer and auto foot lift and servo motor stand. 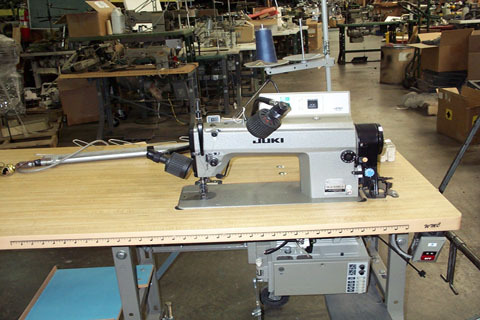 JUKI DLD 432-4-3B Single needle differential feed lockstitch with auto thread trimmer and complete table stand and motor. 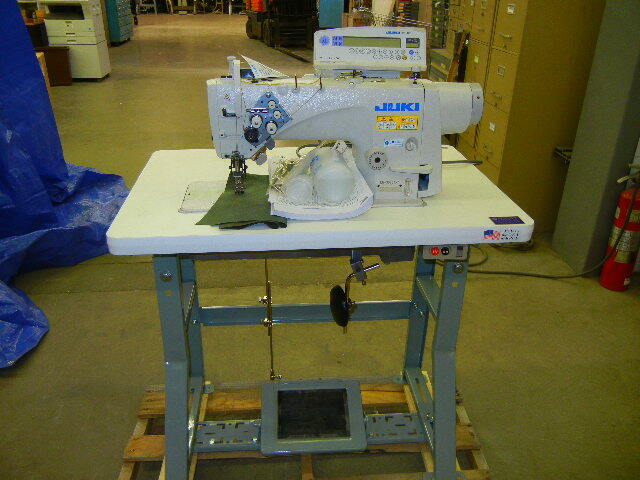 USED JUKI DLM -522 Single needle lockstitch machine with edge trimmer and complete table stand and motor. 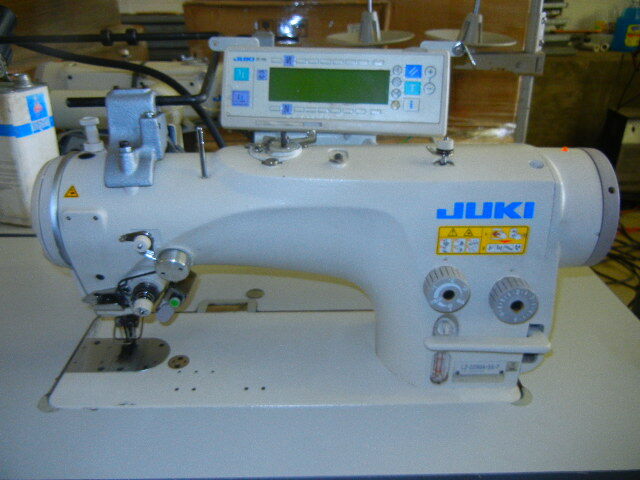 JUKI DLM-5210 Single needle lockstitch with edge trimmer and needle feed and complete stand and motor. 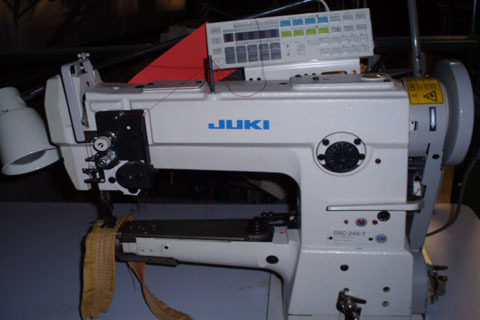 JUKI DLN 5410-6-WB SPS/B- Single needle , needle feed lockstitch machine with auto thread trimmer and foot lift and servo motor stand. 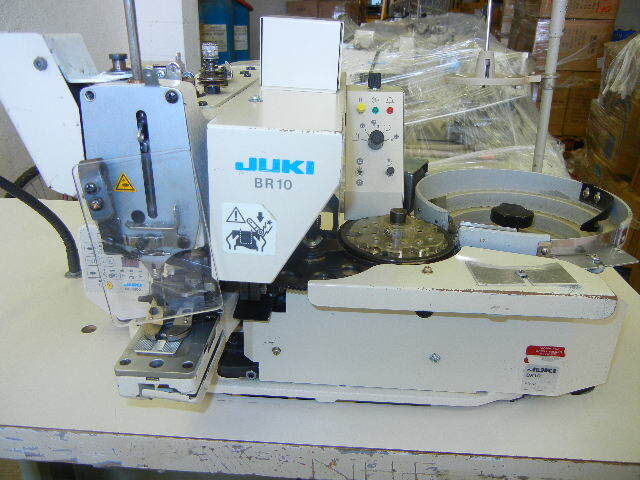 LIKE NEW JUKI DLN 5410N-7WB/CP 160- Single needle, needle feed, full function machines. 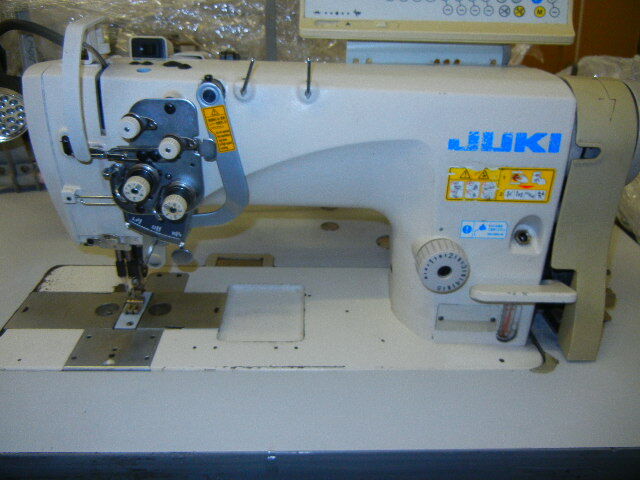 NEW JUKI DLN 5410N-7WB/CP 180- Single needle, needle feed, full function machines. 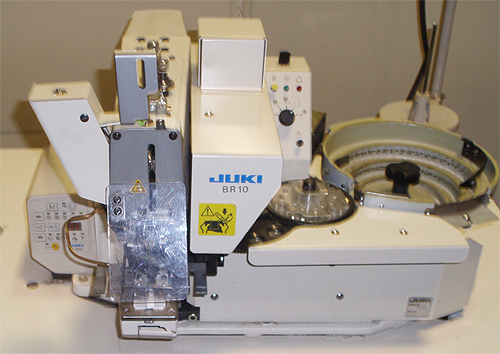 NEW JUKI DLN 9010SS-7 New single needle, needle feed lockstitch with direct drive and auto trim and auto foot lift. 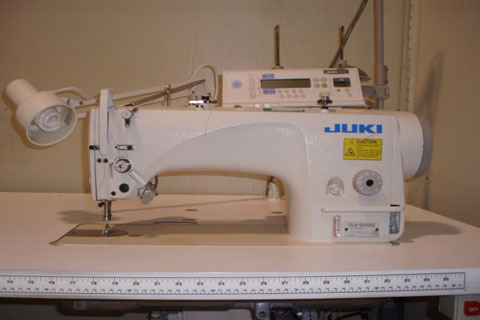 JUKI DNU 241H-7-WB Heavy duty cylinder arm compound feed lockstitch cylinder bed with auto thread trimmer and servo stand. JUKI DSC 245-7-0B Heavy duty cylinder arm walking foot lockstitch with auto thread trimmer and auto foot lift and servo stand. 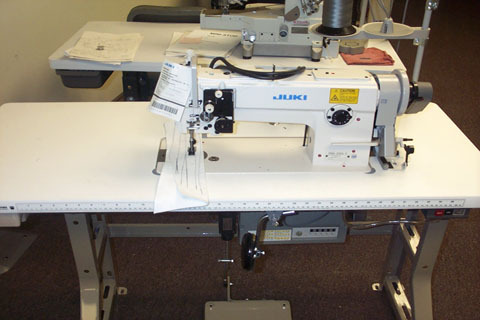 JUK LG 158 Long arm heavy duty double needle lockstitch complete. JUKI LH 1152N- 7-WB Double needle , needle feed lockstitch machine with auto thread trimmer and auto foot lift and new servo motor. 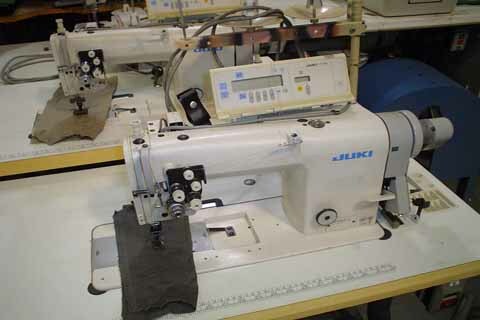 USED JUKI LH 1162-5-4B Double needle, needle feed split needle bar lockstitch with auto thread trimmer and auto foot lift and servo stand. JUKI LH 3168-7WB Double needle, needle feed split needle bar with auto thread trimmer and auto foot lift and servo motor. 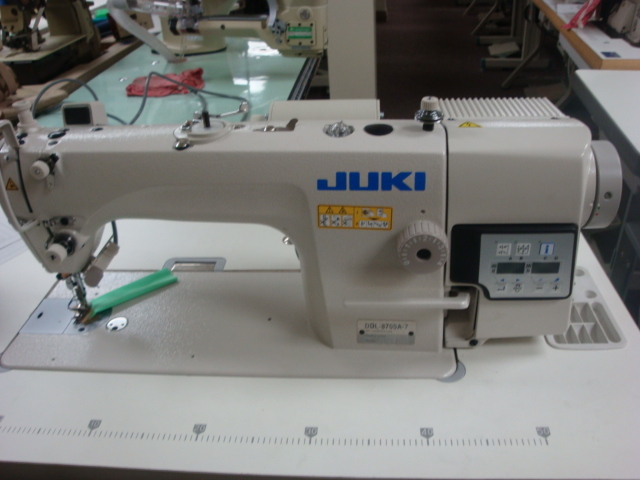 NEW JUKI LH 3528-ASF-7-WB/CP 180/AK 135- Direct drive double needle, needle feed lockstitch with full automatic function and with complete stand and LED sew light. 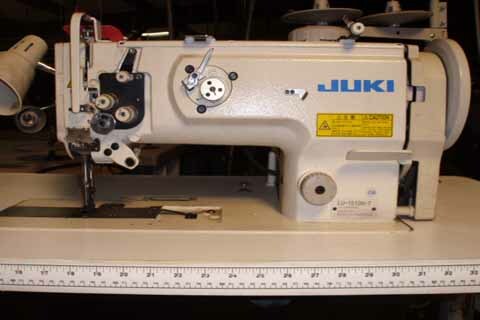 USED JUKI LH 3528ASH-7-WB Direct drive semi dry head, double needle feed lockstitch with auto full function and with servo motor stand and led sew light. USED JUKI LH 3588ASH-7 Direct drive semi dry head double needle, needle feed, large bobbin, split needle bar lockstitch machine with auto thread trimmer and auto back tack and auto foot lift and complete stand and LED. 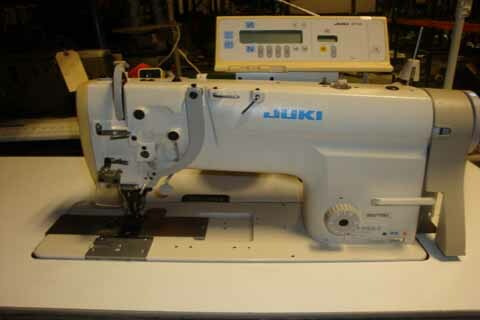 NEW JUKI LK 1903BSS 311/BR 35- Direct drive computer controlled lockstitch button sew machine with automatic button feed robot and complete stand and LED light. 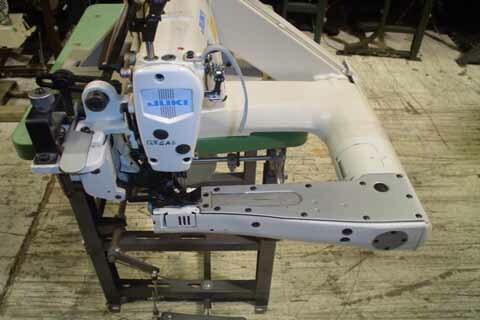 LIKE NEW JUKI LS 1342-7-OB - Single needle compound feed cylinder arm lockstitch with auto thread trimmer and auto backtack and auto foot lift and complete servo motor stand and LED light. 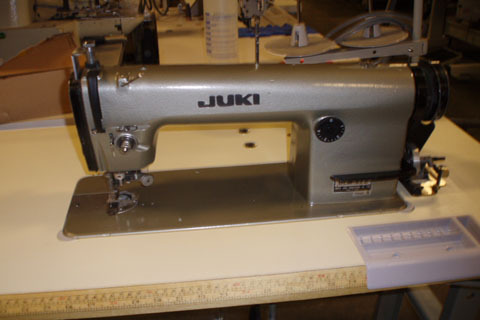 JUKI LU -1510N-7-0BB -Single needle compound feed walking foot lockstitch with auto thread trimmer and auto and auto foot lift and servo motor stand. 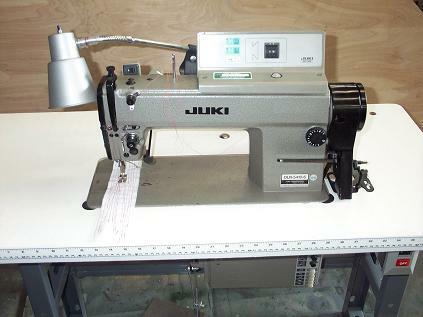 NEW JUKI LU- 1560NF-7-WB Double needle, compound fee walking foot lockstitch machines with auto thread trimmer and auto back tack and auto foot lift and complete servo motor stand and LED light. NEW JUKI MEB 3810J Keyhole button hole machines. 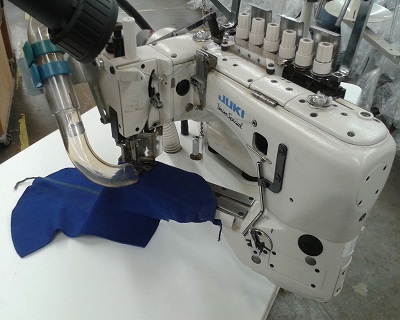 USED JUKI MH 481-5-4B High speed single needle chainstitch mwith auto thread trimmer and auto foot lift and complete stand and LED. NEW JUKI MO 6714-DA-BE6-307- Four thread serger with dry head technology and with chain cutter and templex and servo motor stand. 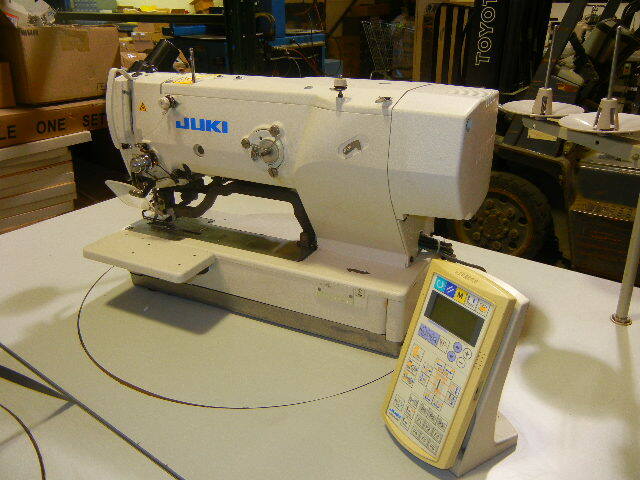 NEW JUKI MO 6716S -FF6-40H- Five thread safety stitch with chain cutter and templex and servo motor stand and LED light. USED JUKI MOJ 3916-FF6-700 Extra high lift top and bottom feed safety stitch with chain cutter and fully submerged stand and light. USED JUKI MOR 3904-0F6-500 Heavy duty top and bottom feed safety with auto chain cutter and fully submerged stand. JUKI MOU 2516-FF6-500 Heavy duty top and bottom feed safety stitch with auto chain cutter and complete fully submerged stand. 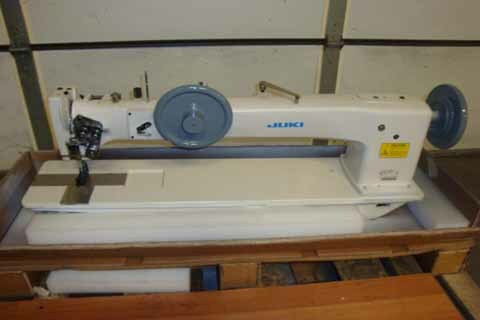 JUKI MS 1261/VO 45 Feed off the arm heavy duty chainstitch felling machine with rear puller and special stand and led sew light. NEW KANSAI DFB 1404 PSF Four needle chainstitch with rear puller for shirt front placket sewing complete with table stand and servo motor and led light. 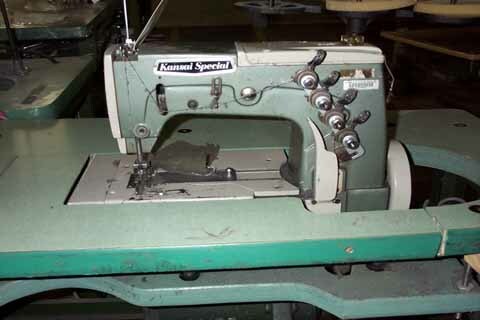 USED KANSAI DFB 1412P Multi needle chainstitch machine with puller and complete with stand. 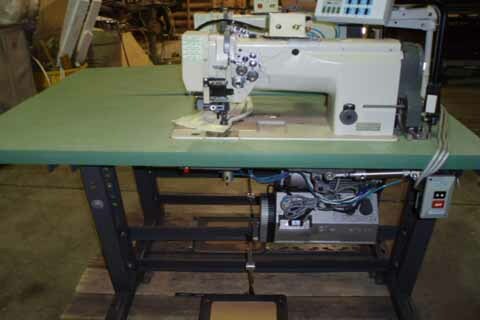 USED KANSAI DPW 1302W Flat bed Picoetta stitch machine complete with stand. 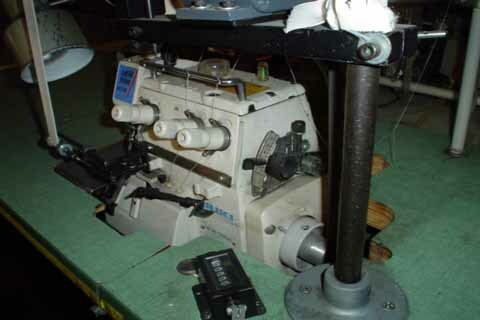 NEW KANSAI SX 6803 DP/FL Heavy duty chainstitch felling machine for jeans with rear puller and auto foot lift and servo motor stand and light. 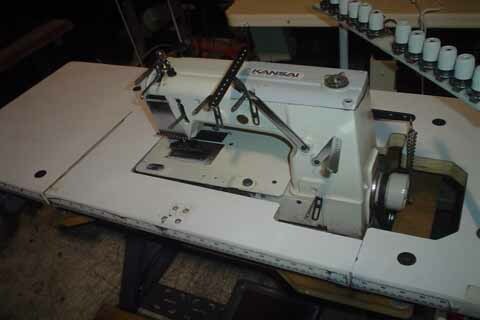 USED KANSAI W-8103D Flatbed coverstitch complete with stand. MERROW 15CA-1 Special crochet edge stitching machine complete. 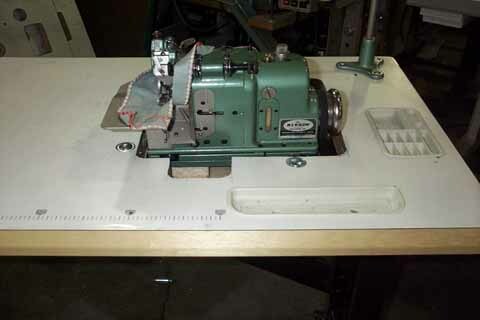 MERROW 18E Blanket stitch machines complete with servo stand 110 volt. MERROW MG-3Q3 Special crotchet edge stitching machine complete. 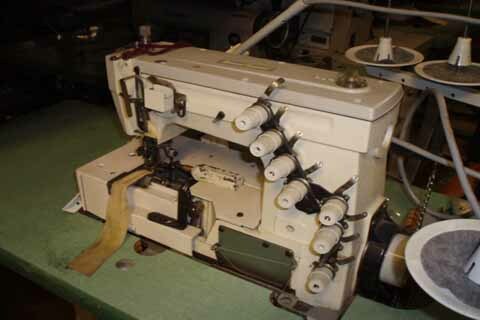 USED MERROW MG- 2DBR-1 Pearl stitch machine complete with 110volt servo motor stand. 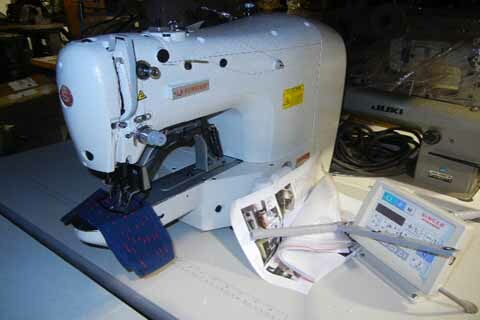 MITSUBISHI LS2-1180 MITW Single needle lockstitch with auto thread trimmer and foot lift complete servo motor stand. 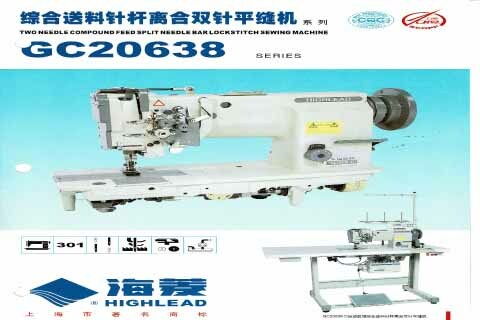 MITSUBISHI LT2-2230 BIT Large bobbin double needle, needle feed lockstitch mahcine with auto thread trimmer and auto backtack and auto foot lift and complete servo motor stand. MITSUBISHI LT2-2230 MITW Double needle , needle feed lockstitch with auth thread trimmer and auto foot lift and complete stand. MITSUBISHI LT2- 2250 BIATW Double needle, needle feed split needle bar lockstitch machine with auto programming and complete servo motor stand. MITSUBISHI LU2- 4710 BIT Large bobbin heavy duty compound feed walking foot lockstitch machine with auto thread trimmer and auto foot lift and servo motor stand. MITSUBISHI PLK-G1010KX Direct Drive computer controlled pattern sewer with 210mm x 100mm sew field. PEGASUS W562-02BB Flatbed coverstitch machine complete. PEGASUS W562-05BB X 364 Flatbed coverstitch binding machine with ato edge cutting knife and complete fully submerged stand. 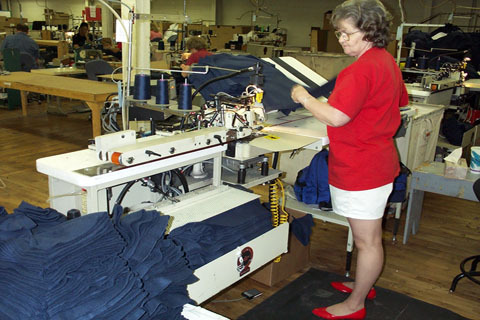 PEGASUS W664-35AC X 364/UT 319 Cylinder arm coverstitch with auth thread trimmer and with right hand fabric trimmer and auto foot lift and servo motor. NEW PEGASUS W3662P-01GX 364BS/UT3J Cylinder bed coverstitch with auto thread trimmer and auto foot lift and complete servo motor stand and new LED sew light. 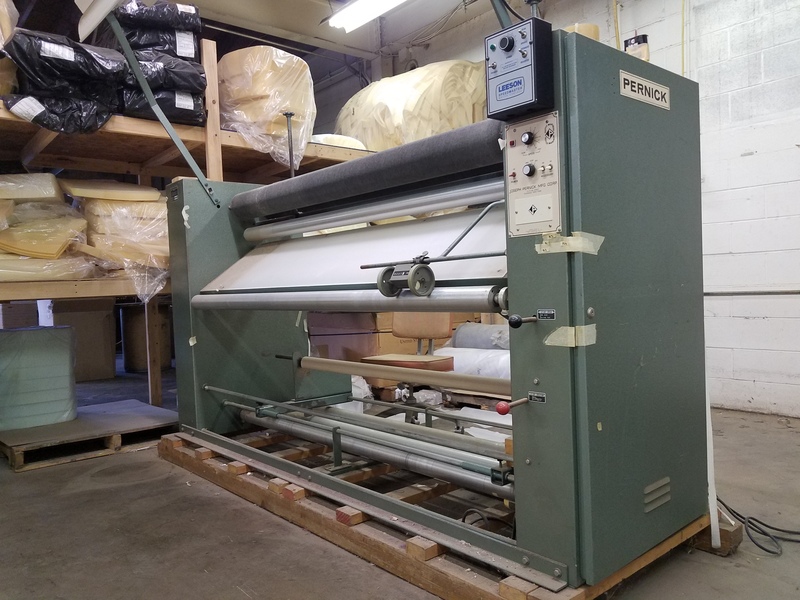 USED PERNICK 78" INSPECTION MACHINE MODEL 10800 SERIAL #9090 complete with updated controls. Very Nice. 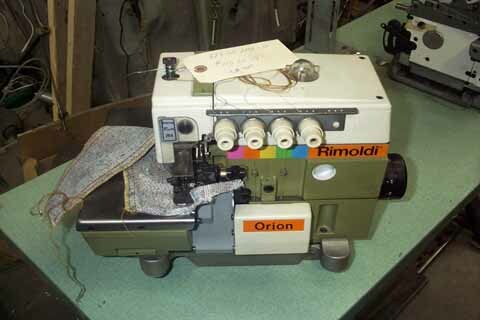 USED RIMOLDI 527-00 1MD/33/136-81 Three thread overlock with chain cutter and complete stand and light. RIMOLDI 629-00 2MD-10 Five thread safety stitch with chain cutter and complete stand. 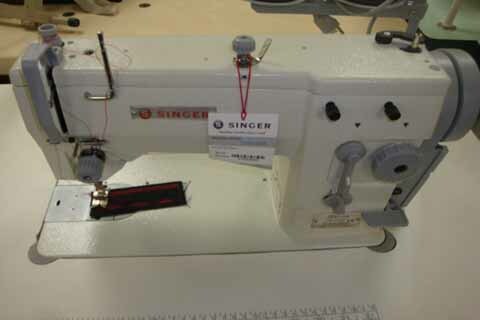 NEW SINGER 20U83 single needle zig zag with servo motor stand 110 volt. SINGER 134W4 Feed off the arm (4) needle lockstitc machine complete. SINGER 1831U 100-5 Five thread safety stitch complete with stand. 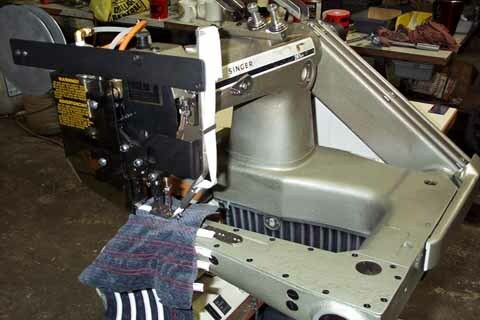 SINGER 261U21 Feed off arm shoulder taping machine complete. 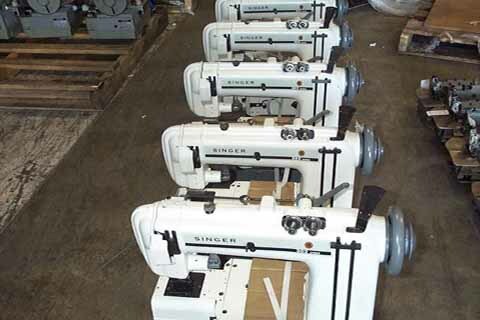 SINGER 2457K-910L (NEW) Direct drive electronic computer controlled zig zag machine with ato thread trimmer and auto foot lift and complete stand. 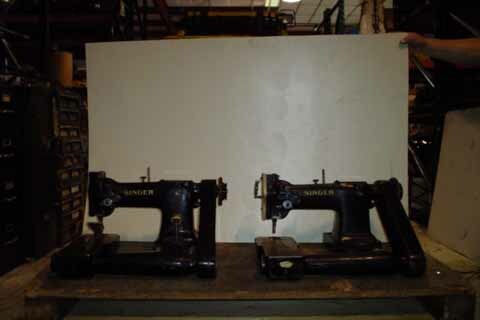 SINGER 2675E-42G (NEW) Direct drive electronic computer controlled proglrammable bartack machine with 30mm x 40mm sewfield and stand. SINGER 302U 201 Cylinder arm heavy duty chainstitch waistband machine with rear puller and special pedestal stand and folder bracket. 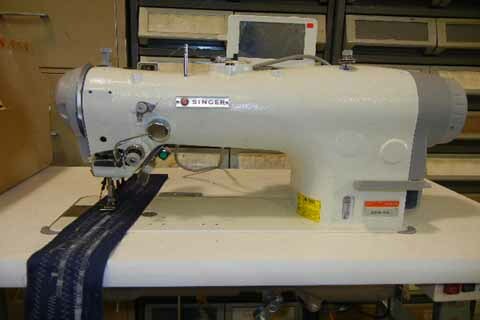 SINGER 320 W194 Long arm walking foot heavy duty chainstitch stitch with complete stand. USED YAMATO VC 2711-156-L-UT/A2 Cylinder bed coverstitch with auto thread trimmer and auto foot lift and complete new servo motor stand. 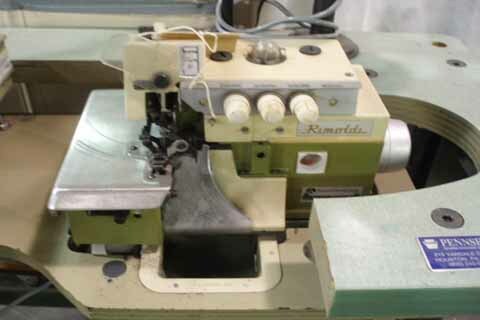 USED YAMATO VC 3845P-303-W09E/UT-A50 Multi needle waistband machine with auto thread trimmer and auto foot lift and new servo motor stand and new LED sew light. USED YAMATO VE 2711-156-L-UT/A2 Extra small Cylinder arm coverstitch with auto trim and auto foot lift and complete new servo motor stand. Gates Industrial Sewing Machine V-Belts. ON SALE for only $1.00 each!